Club Brava, an iconic nightlife haunt. Dedicated lovers of melody flock to this hotspot to get a taste of the newest sounds from experimental DJ’s, spinning seductive blend of music, night after night, making each night a memorable event. You are sure to get an eyeful at the trendy young crowd boogying till the wee hours of the morning! A rocking club inside the El San Juan Hotel, Brava is frequented by celebrities and all-night dance fanatics. It has become a landmark in the nightlife of Puerto Rico. Club Brava & Ultra Lounge welcoming atmosphere and energising vibe draw eclectic audiences. See and be seen at the nightclub where the celebrities frequent and chill out at the upscale lounge. Jive to the best sound system in the Caribbean! The two-level interior is small. The area downstairs has a large dance floor with a well-stocked bar at the back, and tables on the dance floor. Upstairs the dance floor is smaller with a bar in the middle of the walkway and dance floor. There is a glass inset in the floor offering you a jaw dropping view straight down directly into the dance floor below. The music is a mix of dance, reggae and salsa. The club has a DJ driven atmosphere. The DJ’s conjure a cool and high energy vibe for everyone to enjoy. Each night is an evolutionary journey, where the music transform, resulting in an extensive nightlife adventure. There are separate rooms for private parties and it is secluded from the rest of the club. They allow bachelorettes party and birthday parties as well. The restrooms are on the second floor and are fitted with sate of the art bathroom fittings. Transport from the club to your hotel is easily arranged since it is easy to a taxi when you want to leave. Fashionably elegant attire. You will not be allowed inside wearing improper clothes. Dress to impress. No tennis shoes, T-shirts, shorts or hats. Leave your flip flops and shorts, you will not be granted admission. Live DJ’s spinning house, Hip-Hop and Top 40 music. Special guest DJs and artistic performances (On special events or selected dates). 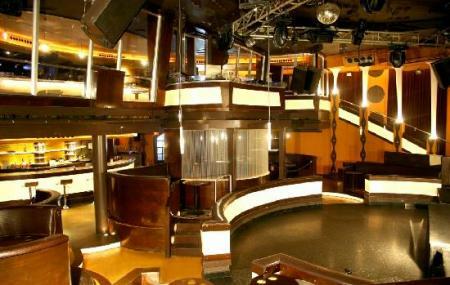 Two atmospheres (Main Room and Ultra Lounge). Premium VIP, Table and Bottle Service. Bottle service is the sale of liquor by the bottle. The purchase of bottle service typically includes a reserved table for the patron's party and mixers of the patron's choice. Available for private events. Bachelorette Package are not valid during special events or holidays. Tables for Bachelorette packages will be assigned upon availability. The age bar attracts very young girls and too many men. You can pay by cash or card. They accept Business Platinum Card as well. And this means you can enjoy special privileges. Bottle service is $1000 which includes the table. You need to get there early if you don’t want to stand in along queue. Otherwise be prepared to pay the VIP prices. This gives you access to upstairs. The crowd is significantly less upstairs and you get a view of the first floor. Venue Admission may vary depending on the dates or events. Management reserves the right of admission. How popular is Club Brava? People normally club together East Island Excursions and Calle Citadel while planning their visit to Club Brava. People also prefer to end their day with Club Brava. 5 stars for vibe and service. If you are someone who doesn’t care about the language and enjoy music, this is the place for you! Drinks were great too Would love to come back when in PR! Club Bravo has a very good energy and crowd but I’m rating at a 3 because of two reasons. 1. the lines are extremely long & unorganized. Plan to wait in line longer than what you’re used to at any club in your hometown. 2. The club did not appeal to other music choices. Yes, PR is a Spanish country but there are a lot of tourist from the US main land and we’d like to hear music in English. There was no variety in the music. After an hour in a half of being there I only heard about 2 English songs. (I’m not familiar with Spanish music). Decently priced. Great time. Great music.